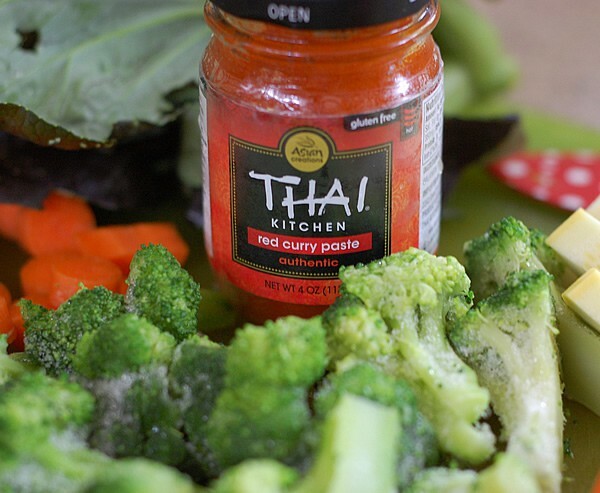 The next time you get a craving for a Thai red curry try this unbelievably easy recipe in less time then it would take to drive to your favorite Thai restaurant. 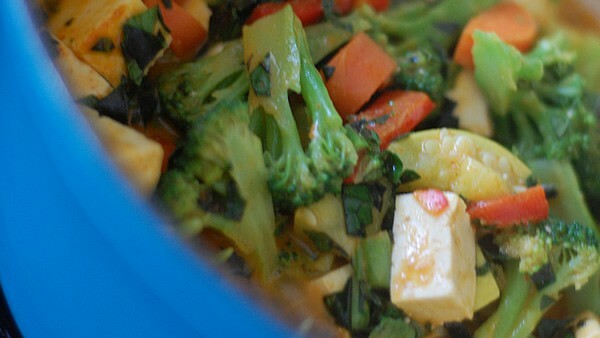 All you need is a can of coconut milk, Thai red curry paste, some fresh or frozen veggies and some tofu. You don’t even need tofu specifically. Kidney beans, tempeh or rehydrated soy curls would fit in nicely too – each one will hearty up the dish a bit. 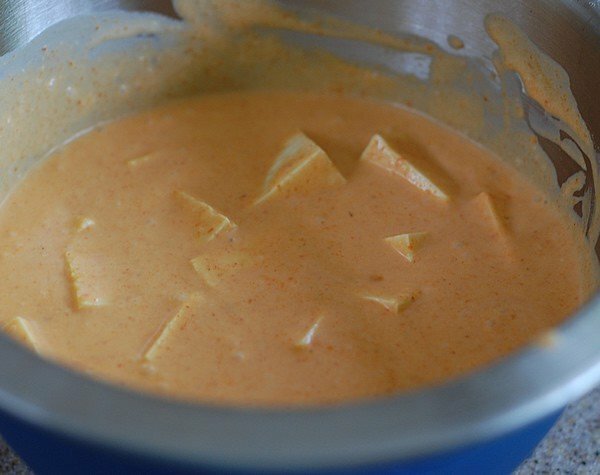 If you know you are going to make this ahead of time you can marinate the tofu in a can of coconut milk (light or regular) and 2 to 3 teaspoons Thai red curry paste. It will work just fine if you mix it all together right before you cook it, but marinating it will give the tofu a richer flavor. Select vegetables that have different textures. 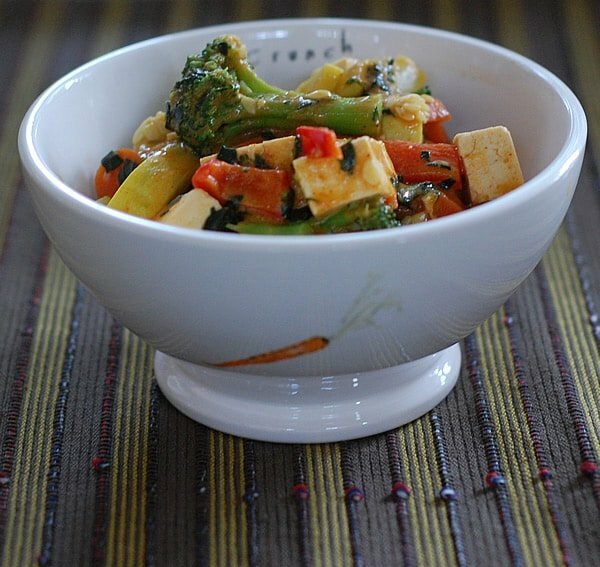 I used summer squash, red bell pepper, broccoli and some red tatsoi. You could add bamboo shoots, cauliflower, winter squash, cabbage – really just about anything you have on hand. The curry paste has the flavor that make a Thai curry great, including the exotic ones like gangala root and lemongrass that can be hard to find outside of specialty stores. The paste mixed with coconut milk makes the easiest international dish you can have for a weeknight dinner. This is so simple you don’t need an exact recipe. If you prefer your food mild use less curry paste and add it a teaspoon at a time until the spice level suits you. Stir in the tofu, 14.5 ounce can of coconut milk, and about 3 teaspoons red curry paste to a large saucepan over medium heat. Add any long cooking veggies like carrots, potatoes or the like, cover and cook for about 5 to 10 minutes until tender. Add in bell peppers, bamboo shoots, summer squash and cook 5 minutes more. 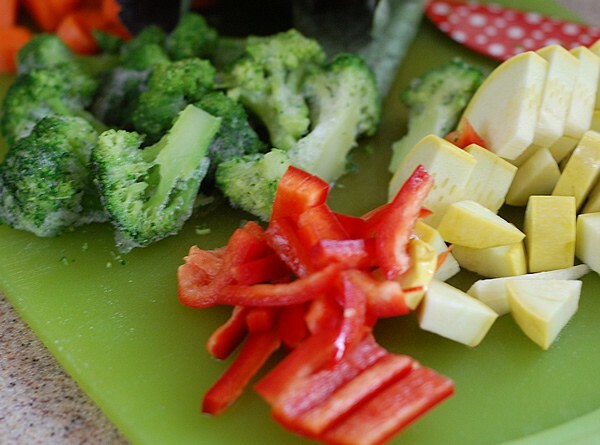 Be sure to add any quick cooking veggies last, like thawed frozen broccoli, greens, etc. Cook for 3 to 5 minutes until these are heated through, add some salt to taste and it’s ready to eat. You can serve over your favorite grain. Best part of all is that it’s cheap too! This is one of my go-to recipes that I make all the time! Love it! The cover of your Ultimate Vegan Cookbook for the IP appears to show a Thai red curry, but I don’t see the recipe in the book. Is it this one, or something else? It’s the Thai red curry zoodle soup in the book.